I have recently obtained a cover which I believe is associated with the 1876 British Royal Hunt in Nepal. According to Dr. Hellrigl, the British Prince of Wales joined Prime Minister Jang Bahadur on a two week hunt from February 20 to March 5, 1876. Only two covers each bearing Dr. Hellrigl's B75 duplex cancel are known from the camp. Both are dated February 24. 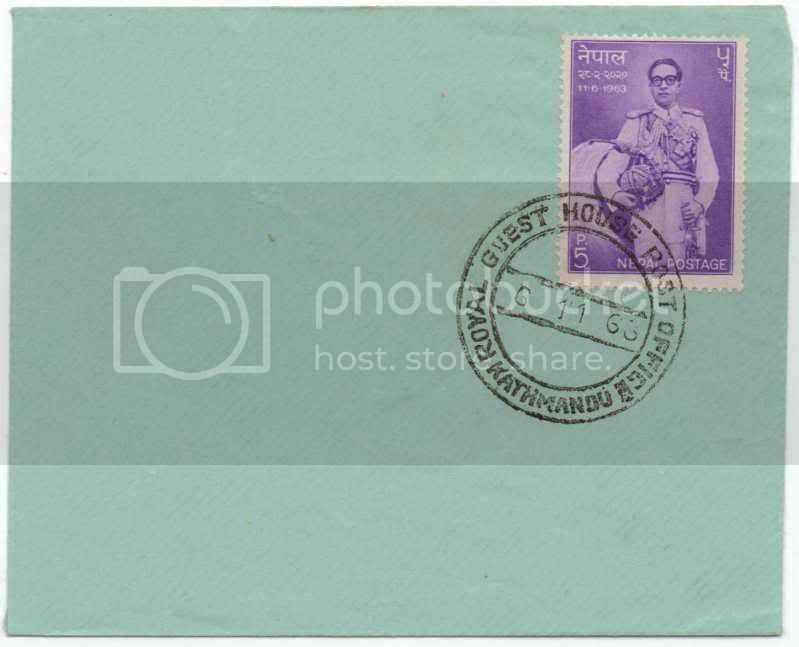 My cover (shown below) was sent to the camp from Rajputana and has a first arrival camp postmark dated February 25. Am I correct in assuming that this cover is genuine and a new discovery? Any comments or opinions would be greatly appreciated. I think it is an incoming cover to the camp while the Prince of Wales was in attendance. Great find. I have the better of the two covers sent from the camp and will post a scan as soon as I can get the cover out of my safe deposit box. Thanks for the comments. I look forward to seeing your cover. That is a lovely cover. 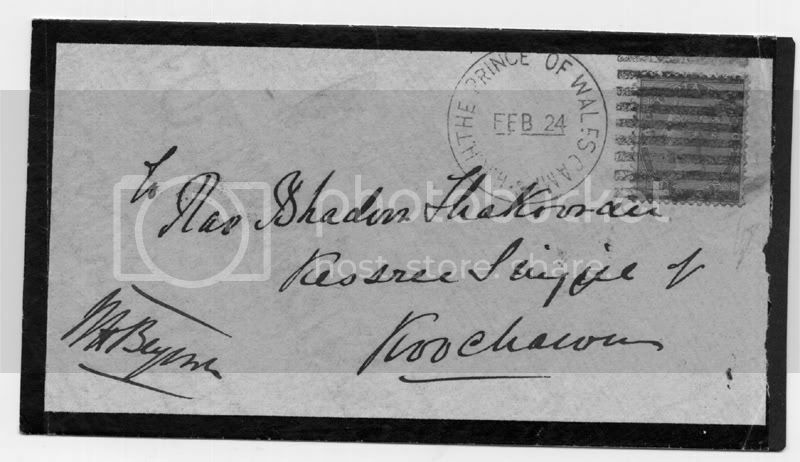 I collect GB royal visit postmarks on cover and this is the first cancel of the collection being the Prince of Wales (later Edward VII ) visit. You might also find these of interest. They are from the 1911 Royal visit to Nepal. They are a pair of items that were sent to the same address in England. The front and back of both items are shown. 2 more very nice covers. I do indeed collect material from this Durbar and there are many mnay cancels for it. The King Emporers was used whilst at the Durbar but is used into mid January 1912 whilst he went on another of his tiger shooting expeditions. I do not have one as late as this. As well as material I also want to get information to aid my writing up. If you have any details on the 1876 whlist in Nepal or indeed any other I would be very pleased to hear from you. Not sure if you will see these clear enough but these are my two well worn covers from the 1876 tour. One has the camp and the other the delivery mark. Great covers! Thanks for posting the pictures. I was unaware that these exisited. If anyone else has material from any of the royal hunting camps, I would be most appreciative if they would also send pictures. It would be nice to see examples of what is out there. 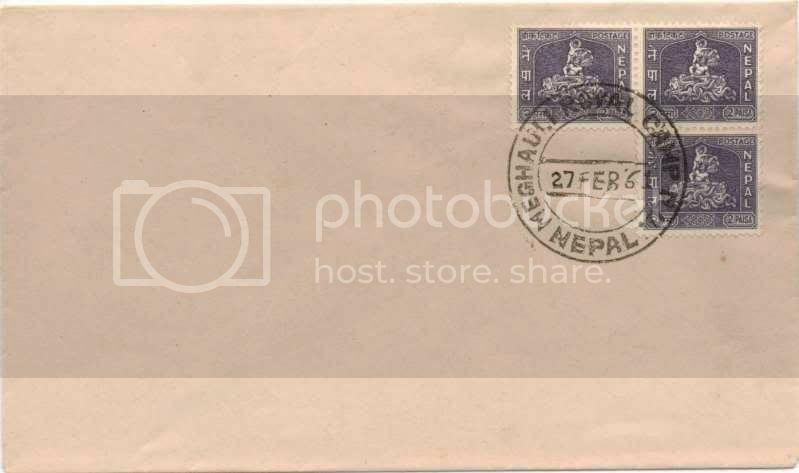 The "Hotel Royal" postmark was to commemorate a visit by Queen Elizabeth and Prince Philip to Nepal in 1961. They were in country from February 26 to March 1. 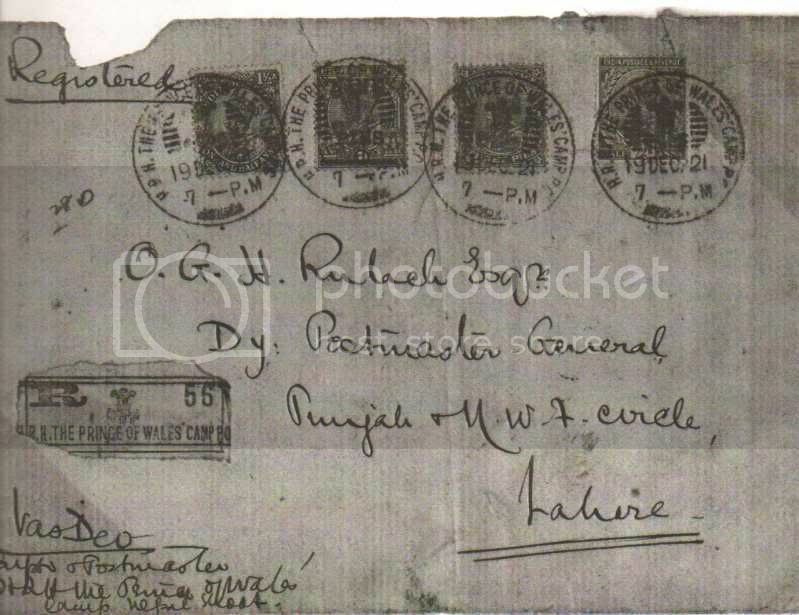 There were three postmarks including the one that you show for the Hotel Royal. They were all similar in appearance. 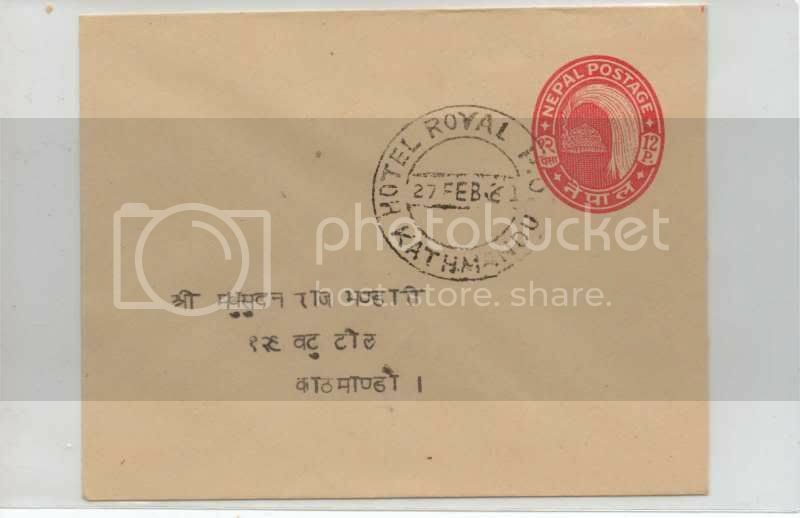 The second is inscribed "Royal Guest House Post Office"; and the third is inscribed "Meghauli Royal Camp." The Hotel and Guest House types can be found with the dates for all four days. The Camp postmark is only found dated February 28. The camp was in the same general area as the 1876 and 1911 camps. A fairly large hunt was organized for the British and Nepalese royals using 305 elephants (over 600 were used in 1911). A tiger and rhino were killed. 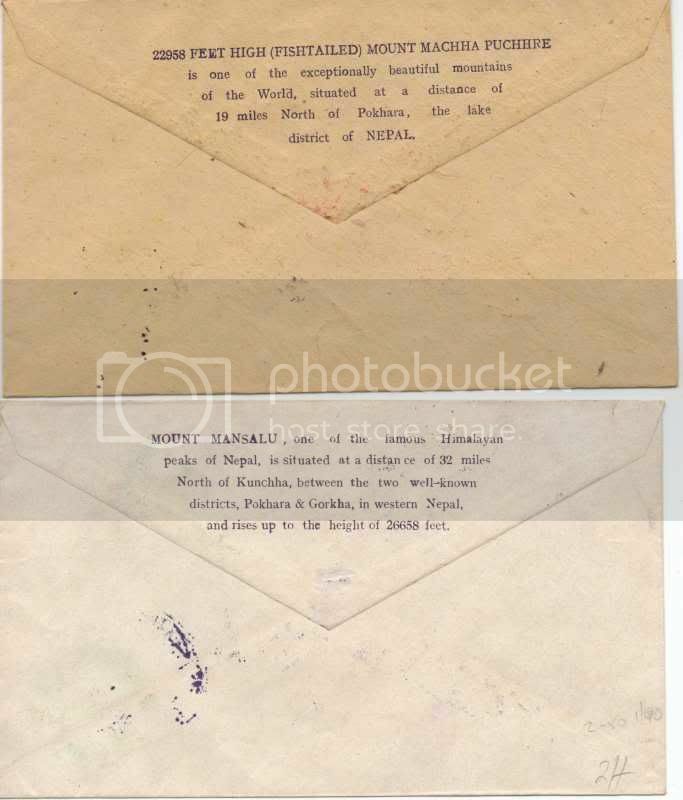 The envelope used for your cover was supposedly not actually issued for general use until 1967 although 200 were supposedly put on sale specifically for the Queen's visit in 1961. 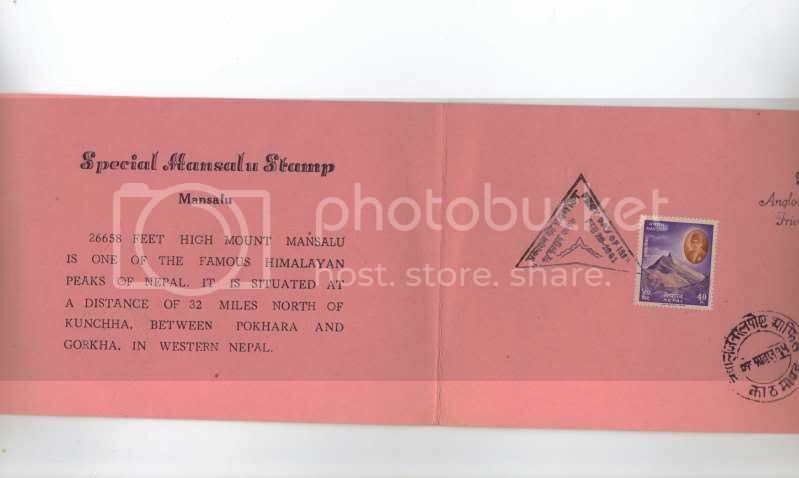 A handstamp reading, "To Anglo-Nepal Friendship" was also supposed to be applied to all mail posted from Kathmandu for the four days of the visit. I have a couple of other royal camp items that I will post pictures of on this site over the next couple of days. A wonderful display of items here.., unfortunately, i only can show a Nepal 4 Anna stamp with Royal Camp Postmark. Another postcard from after the 1911 Durbar. Some thought this was the main reason of the visit. He was longer shooting than he was actually at the Durbar. Are the other postmarks for the 1961 easy to come by? You have expanded my wants list now. I am still confused as to how a card released in 1967 was used in 1961. All three cancels are scarce to very rare. The Hotel Royal is the most common but is still fairly scarce. The Guest House is rare. The Camp postmark is very rare; I have never seen one offered for sale. 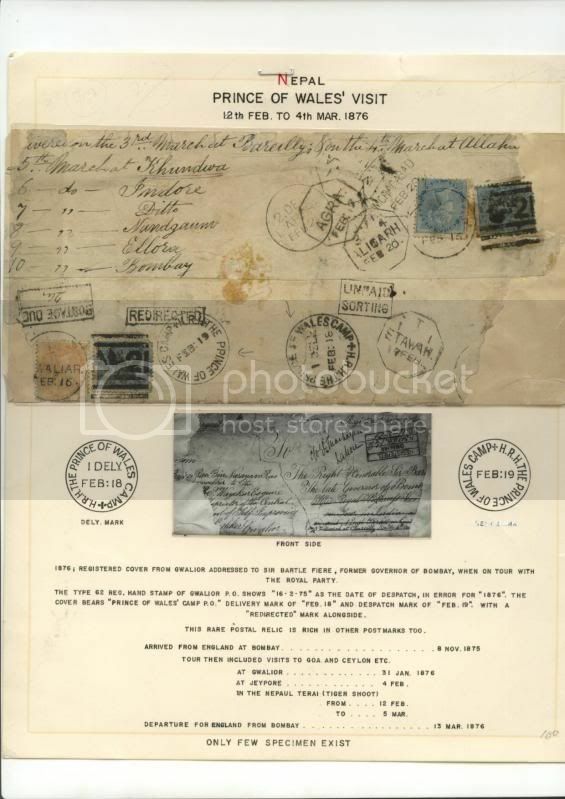 If you assume that envelopes were cancelled in equal quantities at each post office on each possible day, you would have 4 days of use for the Hotel, 4 days for the Guest House and 1 day for the Camp giving 9 possible post office/sales days. Only one out of nine such days would apply to the Camp example. Divide 9 into the 200 total supposedly issued; and you get roughly 23. Double this quantity because the Camp would probably have had a greater than average usage for its single day; and you get an estimate of 45 to 50 covers for the Camp post office. (Based on what I have seen offered for sale, this estimate is probably a bit high.) A reasonible estimate for the Hotel post office would then logically follow as about 125 to 140 and for the Guest House as about 75. Of course, a number of envelopes were probably lost or destroyed resulting in a somewhat lower number of each type still in existence. I have been told that the 12 pice envelope was printed to meet a rate change that was planed for 1961-2 but which did not actually occur until 1967. Most envelopes were supposedly held in the treasury until needed in 1967 except for the few that were philatelically used for of the British visit. I do not know for sure if this story is true; but it at least sounds plausable. 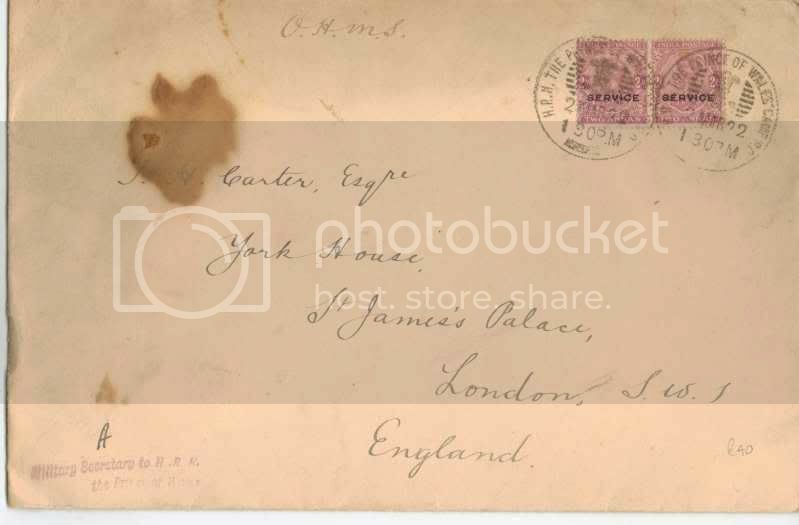 I thought that I would expand the subject matter of this thread a bit by showing examples of hunting camp mail not connected to the British visits. These are pages from an exhibit of Nepalese Seals, Cancellations and Postmarks 1795 to 1911 that I am currently working on. You made me go back to my file for this tour as it is one I have not written up yet, though may do so soon with all the information you are kindly giving me. I cannot recall actually getting these though I did purchase a large lot , mainly of Pakistan cancels, and may not have recognised the significance of them. However they now give other questions. The camp one is dated the 27th. You say it was only used on the 28th. The date for the guest house seems way out unless I am reading it wrong. I have found I have a duplicate of the Hotel cancel. These are the Anglo Nelpal covers I have. Very similar apart from the quality of the paper. I also have what seem to be presentation cards but one on pink card and the othe more of a parchment. Presumably privately produced items? Nice Material! The information that I was quoting was from a book picturing the fabulous collection of Dr. Armand Singer. 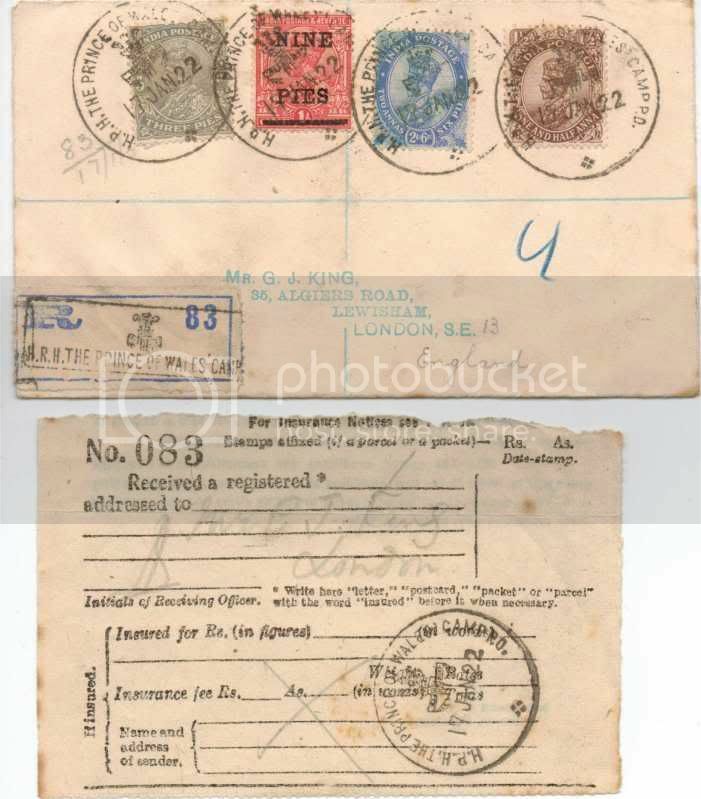 He shows several covers from the Queen's visit including the postmarks that you show. He notes that the camp postmark was supposedly limited to the single day. However, I just noticed that Colin Hepper's handbook on modern cancellations pictures a cover with your date. Obviously the camp postmark was used for at least two days rather than the one given by Dr. Singer. I have no idea why your other cover has the 1963 date. I can find no reference why this postmark should exist with such a late date. One of the wonderful things about collecting Nepal is that unexpected things seem to pop up on a regular basis. Hopefully one of the other forum members may be able to answer this question. 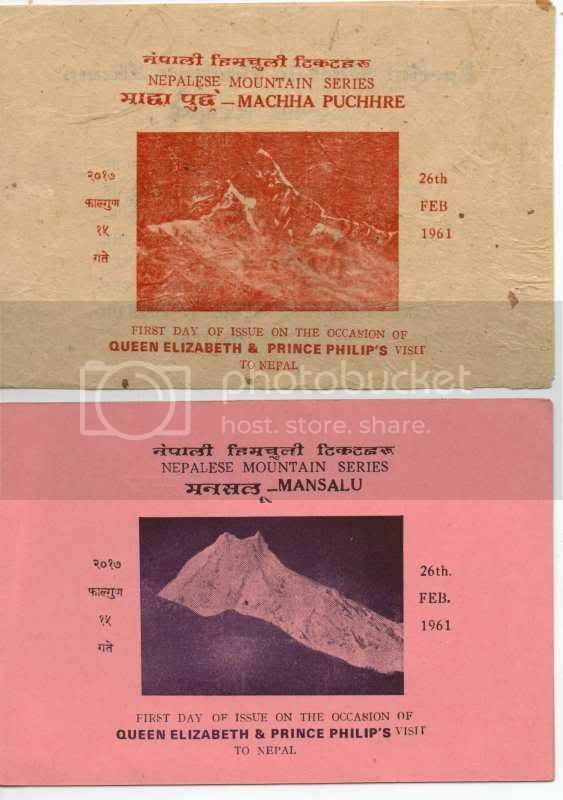 The two mountain stamps were of course issued during the Queen's visit which is why they have the "To Anglo Nepal Friendship" mark. I believe that starting with the UPU set in 1959 official folders were available on the first day of issue. 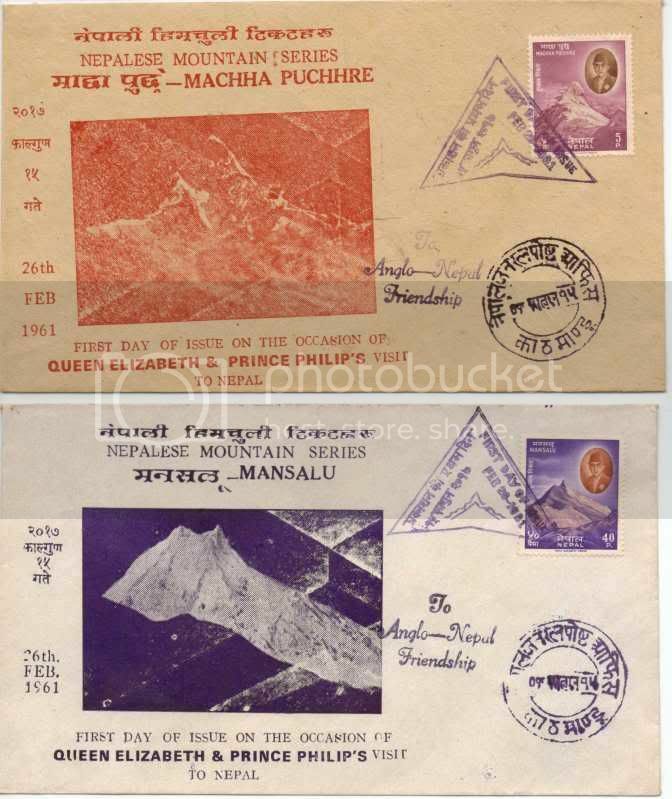 Your examples may be the official ones for the mountain stamps. I do not collect the folders and do not know for sure. Again hopefully someone can give us a certain answer. Scans of my 1876 Camp cover. I have just acquired a rather interesting cover. It doesn't look like much. 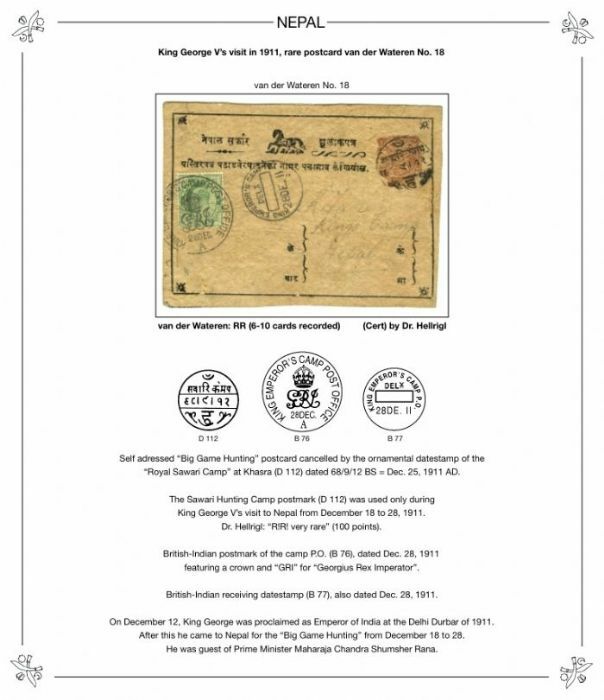 However, note that it was cancelled with a Viceroy's Camp postmark dated April 1, 1901. This mobile post office accompanied the Viceroy on his tours around India. Lord Curzon, the Indian Viceroy, was hunting in Nepal for three weeks from March 27 until mid April in 1901. 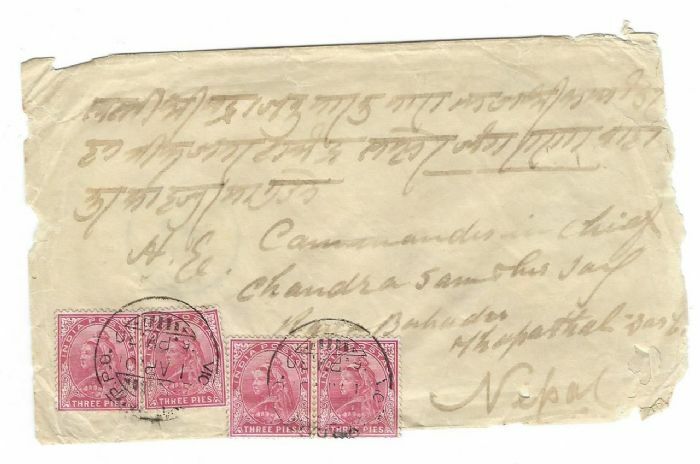 This cover was thus mailed from his hunting camp in Nepal in the same manner as camp mail was sent from the British royals' camps in 1876, 1911, and 1921. Has anyone seen another example from this camp in Nepal? 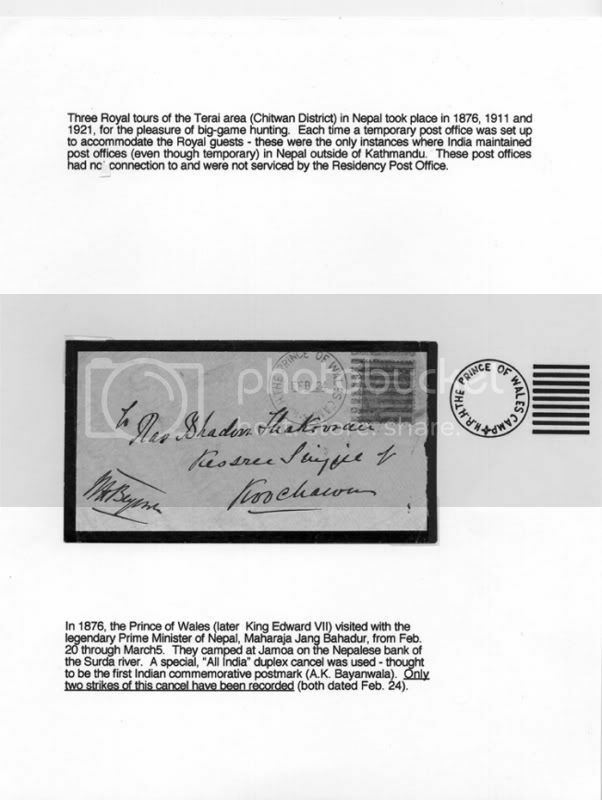 It is addressed to the Nepalese Commander-in-Chief Chandra Shumsher Rana in Kathmandu and has a British Residency receiving postmark dated April 4 on the reverse side. Histories which mention the 1901 Viceroy's trip to Nepal list Chandra as the Nepalese host. However, he is not pictured in the official British photographs of the hunt although other high ranking Nepalese are. This cover seems to imply that he was not present at the beginning of the hunt. Dear Ed, a fine and rare cover. Thank you for sharing. The official host was Prime Minister Deva Shumsher, but Chandra Shamsher joined the Indian Viceroy. It seems you are right, Chandra was in Kathmandu during the first days of the hunt. Lord Curzon became Viceroy of India in 1899. Soon Maharaja Bir Shumsher invited Lord Curzon for a tiger hunt to Nepal, and Lord Curzon confirmed his coming on January 2, 1901. Unfortunately after all the preparations were completed, Bir Shumsher became ill and died on March 4, 1901. His successor Prime Minister Deva Shumsher, a shy and frail person, sent his younger brother Chandra Shamsher to join the Indian Viceroy hunting tigers in the Terai. The hunt took place from March 29 to April 17, 1901. For a photographic documentation of this tiger hunt with Lord Curzon the renowned photo studio “Herzog & Higgins” was asked. P. A. Herzog and P. Higgins had opened a photo studio in Mhow (Central India) in 1894, which existed until 1921. As official photographers they were asked for many important occasions at the time, so at receptions, state visits, etc. 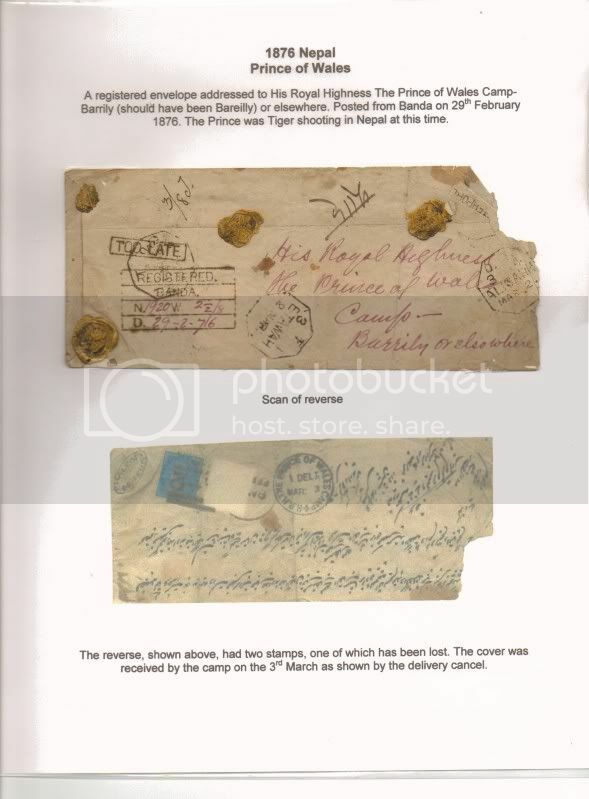 The photographic results of the tiger hunt in 1901 in the Terai is the album “HE the Viceroy's Shooting tour. Nepal, Terai, April 1901”, which includes 120 photos. 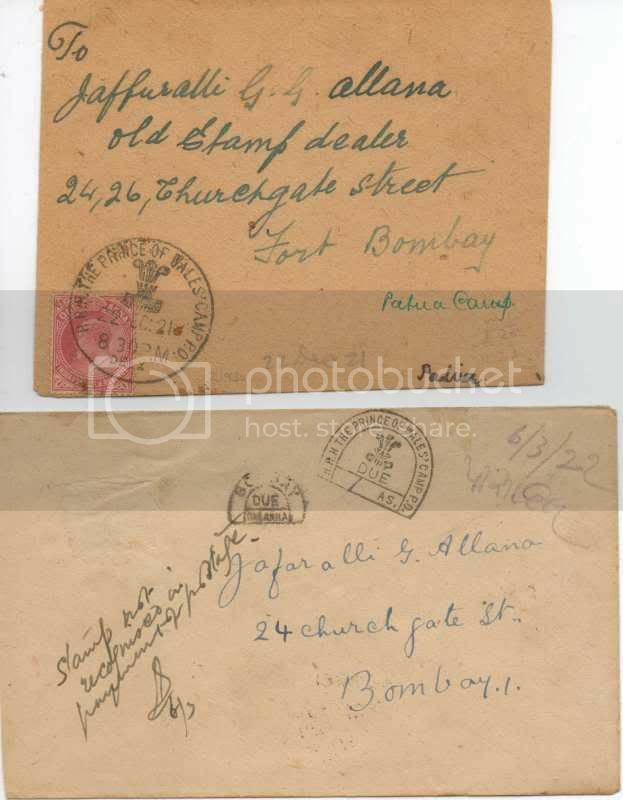 When the hunt was finished, P. A. Herzog wrote two postcards from Kathmandu to Basel in Switzerland and to Mhow (Central India) respectively on the same day, Apr. 26, 1901.